* An “Abort Launch” button has been added to the Air Ops menu. When clicked, any of the selected aircraft which is preparing to launch will abort the sequence and attempt to return to an available parking facility. * Only aircraft that are in a parking facility can be armed. This solves the problem of airbase traffic jams due to aircraft being readied while they are parked on transit points, e.g. elevators. * When an aircraft being re-equipped (at its base) ends up in Winchester status because one or more of the loadout’s primary stores are missing, the outfitting is cancelled and the aircraft reverts to Reserve (clean) loadout. If this is happening interactively (ie. the player has manually ordered this re-equipment) then a notification pop-sup for this; otherwise the action is performed silently. * Tweaked the non-bingo RTB behavior for aircraft so that they return to base at full rather than cruise throttle. When an aircraft is about to occupy a transit facility (e.g. elevator on ship) in order to get to the runway and take off, a check is first made if another aircraft is in the post-touchdown sequence. If that’s the case, and if only one transit facility is available, the outgoing aircraft is held to wait so that the incoming one uses the transit facility to clear the runway. Likewise, the air boss sends back aircraft to hangars more selectively (much more rarely). Crews are now context-aware in their logic of picking the most suitable tanker. Depending on what the aircraft is supposed to be doing (enroute to mission, returning, free-roaming, on patrol, on support circuit etc.) the optimal choice is often significantly different. Tankers are now smart enough to avoid overbooking (and thus getting completely drained). They now reject refueling requests that they estimate they will not be able to service. Aircraft returning from a mission (e.g. strikers on the RTB leg) will opt to bypass available tankers and head straight for their home bases if possible. This lightens the load on available tanker assets and eliminates the need to manually change the “use refuel” doctrine mid-mission. If they do need to refuel on the return leg they do as before. * Fighters launching BVR missiles now regularly attempt to “crank” (turn to the side while still tracking/painting as necessary, and throttle back) once they have taken all their shots. The purpose of the maneuver is to reduce the rate of approach with the enemy and thus delay enemy countershots as much as possible. 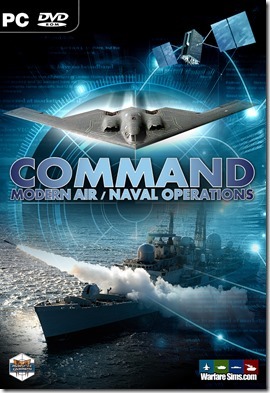 * Aircraft now determine the correct altitude to drop their ordnance much more reliably without manual control. * Helmet-mounted sights (HMS) are now taken into account when deciding how much off-boresight an aircraft can shoot an AAM. * Aircraft dropping sonobuoys are now constrained by the channel capacity of their sonobuoy datalinks. In most cases this means they will drop fewer sonobuoys per “string”. To compensate for this, the default minimum spacing between successive sonobuoys has been doubled. * Aircraft now have different safety margins for the Bingo calculations depending on their type. “Force-multiplier” assets like tankers, AWACS, EW aircraft have higher, more conservative safety margins while more “expendable” assets like tactical fighters have lower, more aggressive margins. * Any aircraft with less than 1500 lts of internal fuel remaining is considered to be in bingo status regardless of its proximity to its home base (this helps with bingo calcs very close to the base). * Aircraft AI improvements. Group members now always stick with the leader on a manual plotted course even if they have strike targets assigned. * Major new simulation feature: Payload weight & drag affects the aircraft fuel consumption. You can test this easily by e.g. assigning two identical aircraft to a patrol, one heavily armed and one lightly loaded, and comparing their endurance & range figures. * Engine throttle (cruise, full, flank etc.) is now taken into account when calculating the IR signature of aircraft, and thus its detection range by a sensor. * Aircraft on ground attack whose attack profile altitude is lower than the minimum weapon release altitude will attempt to stay just over the latter (instead of bombing from max release altitude). This significantly improves bombing accuracy but can also make aircraft more vulnerable to air defences. * Improved weather effects modelling: cloud cover now significantly disrupts EO/IR/laser sensors, depending on cloud thickness (difficult but doable in light/medium clouds, but good luck dropping LGBs from med/high altitude in typical CentFront weather). * The various altitude parameters (transit altitude, on-station altitude etc.) 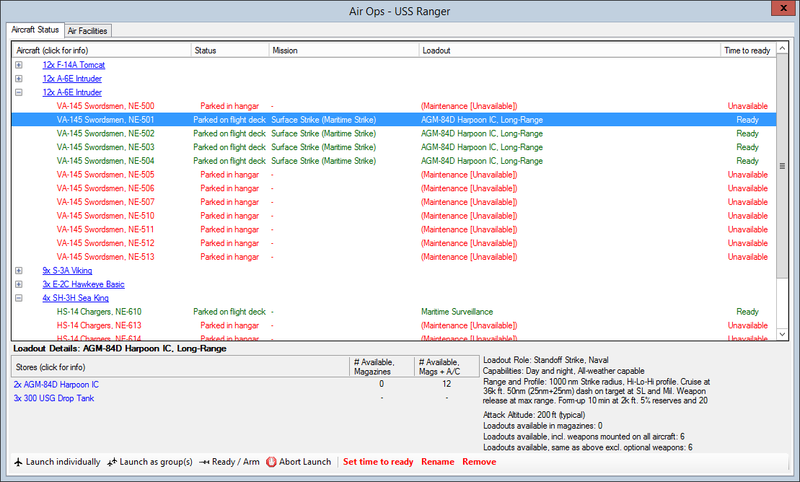 of a loadout’s mission profile are now enforced for air patrol & support missions. So for example a P-3 on a typical ASW patrol will transit at high altitude (optimum fuel consumption) and once it enters the patrol area it descends to 300m for the actual patrol. Combined with the optional altitude overrides for patrol & support missions, this means that an aircraft’s altitude is now configurable at 3 different levels (controlled by loadout, controlled by mission-level override, or finally overridden by direct player input). * Modified patrol behavior for aircraft: Once they get a class ID on a contact, if they do not have suitable weapons to engage it, they stop going after it and resume their patrol. This is meant to address the “MPA twirls over hostile surface ship and gets shot down” problem. * Aircraft returning to base on RTB-Mission Over / Winchester / Manual status now accept course orders (but not if they are on RTB-Bingo). Speed is life: Most AAW weapons are optimized for engaging highly-subsonic (500-600 kts) targets since this is by far the most common flight regime in the jet age. Target aircraft at higher speed are proportionally more difficult to engage both for guns and guided weapons. The degradation depends on the maximum target speed of the AAW weapon (listed on the DB viewer); for example a SAM with a 1500-kts max target speed will be severely degraded against a 1200-knot target while a missile with a 5000-kt max target speed will barely notice the difference. This makes high-speed aircraft like the SR-71 and MiG-25R (and UAVs like the D-21 and Tu-123) very tough targets even if the intercept geometry is achieved, which is consistent with RL reports. This also means that an aircraft evading a missile (and having its speed reduced as a result of the manouver) will, for at least a few seconds, have reduced ability to dodge subsequent attacks until it accelerates again to higher speed. This means that oft-quoted real combat examples like the “Kosovo Slammer Dodger” (the Serbian MiG-29 that evaded 3 AMRAAMs before finally succumbing to the fourth, probably because it was close to stall speed by then) are actually now reproducible in the sim. So ripple-fire those AAMs/SAMs! The evasion bonus must now be earned: Until now all aircraft got their full evasion bonus (as long as they detected the incoming weapon) regardless of their actual geometry at the time of impact. This allowed players to “cheat” by disabling auto-evasion on an aircraft, heading stright down their target (or enemy shooter) and still get the full evasion modifier. Now however, the projected impact angle is critical: High-deflection (“crossing target”) impacts maximize the agility effect, while head-on (less so) and tail-on (severely more so) impacts significantly reduce the actual evasion modifier (with further variations for forward-oblique and rear-oblique geometries). So now it often comes down to “beam or die”, as in known RL engagements. 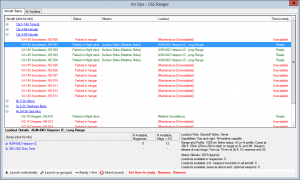 * Airborne aircraft assigned to strike mission via right-click menu or Unit -> Assign To Mission will have flight plans automatically generated for them. * Side-firing gunships (e.g. AC-130) now manouver properly to place their targets on their weapons’ line of fire. * Snap-up/down limits are now taken into account for AAW guided weapons. * Mechanical-scan radars (with the exception of ICWI-capable sets) cannot perform volume scan while they are providing SARH illumination for missiles. So e.g. once a fighter launches a Sparrow at a target it becomes radar-blind to any other contact while it is guiding the weapon. This can severely reduce situational awareness if the fighter is not backed-up by other friendly radars. (It also makes possible co-operative “you draw missile fire and I’ll flank and stab him” tactics). Phased-array or ICWI-capable radars do not have this limitation. * NEW: On multi-engine aircraft, engines are now treated as discrete components instead of a single “Powerplant” entity (for example a B-52 will now have 8 separate J57 engine entities). This doesn’t affect anything ATM but will be necessary for the aircraft-damage improvements in the future (incl. damage from EMP). Existing scenarios have to be deep-rebuilt in order to feature this. * Aircraft will now jettison their A2G stores when evading an attack (if the relevant doctrine setting is set to YES). This is accompanied by a relevant message detailing the stores ejected. The jettison check is made every 5 seconds (it takes a few seconds to do this in the cockpit), so there is a chance that an aircraft that is caught by surprise will have no time to jettison its stores before the missile impact happens. Also only external stores can be jettisoned. The current implementation has a known issue: Conformal Fuel Tanks (CFTs), like those on the F-15E and numerous export F-16s, are treated like drop tanks and thus jettisoned (in RL they cannot be ejected). This is to be addressed in the future. * Unguided bombs and rockets fired in salvos are now impacting as “sticks” rather than treated as totally individual/independent impacts. So for example when weapon #1 impacts at coords X-Y the rest of the salvo will (CEP deviations aside) fall more or less on a line pattern starting from that first impact. This is particularly important when attacking multiple-aimpoint facilities as it forces the attacking unit to “commit” to a specific aimpoint (straddle it with weapon impacts) and just hope for collateral damage on the other aimpoints. * Fixed: Ignore gun strafing doctrine under manual fire. * TWEAK: Airborne GMTI radars (e.g. J-STARS) detect moving targets more easily. * Significant improvements to stick bombing mechanics: The bombs are laid across the target, using CEP (adjusted by bombsight generation and pilot skill) and random factors to determine the exact impact points of individual bombs. For smaller bomb sticks on tactical aircraft, the bombs are released at 50ft intervals. Bomb sticks up to 24 bombs are laid in sticks up to 300ft long, larger bomb sticks are laid in sticks up to 600ft long. Bombers are handled slightly differently, with 75ft between bombs and stick lengths up to 2000ft. For sticks with 28 bombs or more, the distance between bombs is narrowed. * More realistic altitude/attitude behavior for aircraft close-combat maneuvering when intercepting target: “Point” at the target instead of just heading to its altitude. * Aircraft now begin maneuvering against missile fire earlier (20 secs before estimated impact instead of 10). They will also attempt to dive towards the ground to drag the missile down and increase their own evasion agility. * Aircraft evasion agility depends on altitude (at high altitude most aircraft are really sluggish). Super-maneuverable aircraft (TVC etc.) suffer less from this. * Aircraft using standoff A2G munitions (incl. LGBs) will now try to keep their distance from the target if the “Maintain standoff” doctrine option is enabled. These improvements help avoid some common “stupid” behaviors like merging head-on while not having a suitable weapon (e.g. no gun and only rear-aspect missiles) or exposing one’s fighter to the target bomber’s tailguns.